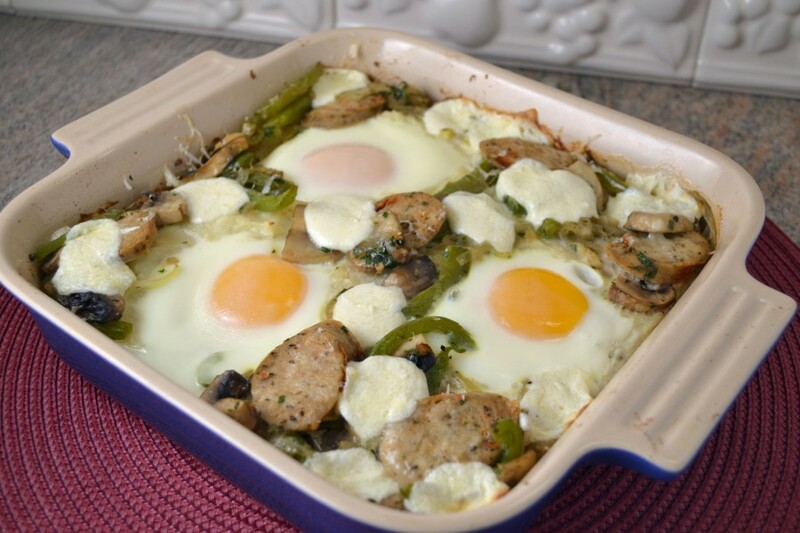 This may look like just a casserole but hidden beneath the layers of sausage, vegetables, cheese, and perfectly delicious runny egg yolks is a pizza crust like no other. Seasoned mashed potatoes are baked until just a touch crispy so they hold together to create that carb replacement for the average pizza dough. The mashed potatoes also add a richness that makes this unusual pizza both filling and satisfying. So why the casserole dish instead of a baking sheet? The original recipe titled “Potato and Egg Pizza” in “The Art of Good Cooking” says to use a baking sheet such as a jelly roll pan. I decided to use a casserole dish simply because I wanted a fairly thick layer of mashed potatoes, a favorite comfort food of mine. However, any baking sheet with an edge would work well here. 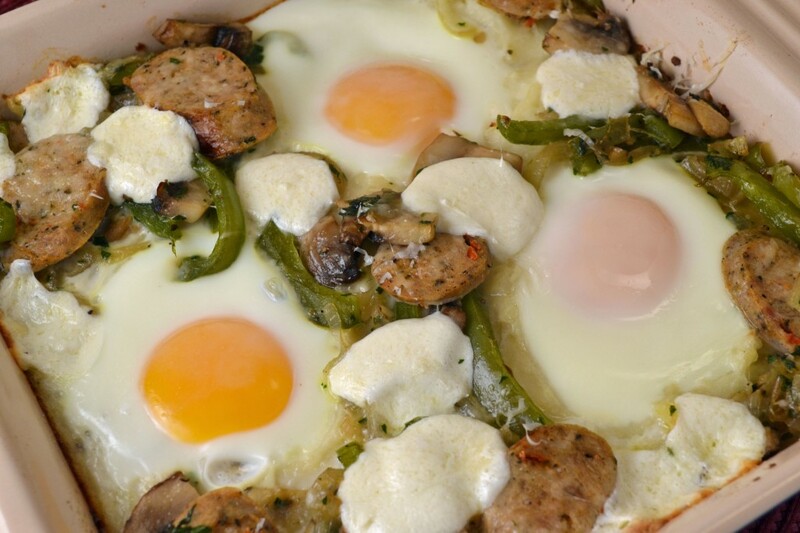 The beauty of this Mashed Potato Egg and Sausage pizza is how over-the-top it is. Onions, pepper, and mushrooms along with sliced sausage (I used Italian style chicken sausage) are just the beginning. Fresh mozzarella, Parmesan, and star-of-the-show golden yolks, ooze over the mashed potatoes. Try it with garlic mashed potatoes and this may be one unforgettable pizza. Grease a large flat baking dish (such as a jelly-roll pan) generously with as much olive oil as necessary. Spread mashed potatoes evenly. With the back of a large spoon, make indentations in the mashed potatoes for the eggs which will be added late. Bake potato-lined pan for 30-40 minutes or until potato seems slightly brown and crisp on bottom. Remove from oven. While potato is baking, sauté onion, garlic, mushrooms and green pepper in remaining olive oil till soft. Slice cooked sausage 1/4 inch thick. After potato has been removed from oven, spread top of it with sautéed mixture and sliced sausage, leaving indentations clear. Break eggs into each of the indentations. Sprinkle with Parmesan cheese and dot with pieces of mozzarella cheese. Return to oven. Bake about 25 minutes, or until eggs are set and cheese bubbling. To serve, cut into wedges or squares. I’ve had eggs with mashed potatoes before, but I never thought about making a pizza like that. It sounds very tasty and I’ll have to give it a try.